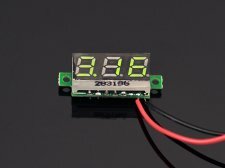 This is a super mini voltmeter with 0.28inch LED display. It has reverse connect protection function. When voltage is less than 10V, two decimal places will be shown. When voltage is more than 10V, one decimal place will be shown. This voltmeter can be used to measure mobile phone battery ,car battery and such other application.